With high torque gear reduction, variable speed control and an intelligent electronics package, the WEV15-125 HT 13.5 Amp 5 in. 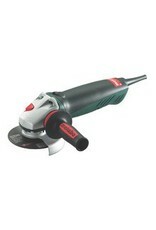 Angle Grinder with VTC Electronics and Lock-On Switch is specially engineered for stone and marble preparation. This compact angle grinder features a powerful motor that includes advanced designs to optimize air flow for cooler operation and extend longevity in harsh environments. Additional electronic features include speed stabilization, overload protection, power interruption protection and soft start.